Spinal stenosis is a condition in which the spinal canal narrows and the nerve roots and spinal cord become compressed. Because not all patients with spinal narrowing develop symptoms, the term "spinal stenosis" actually refers to the symptoms of pain and not to the narrowing itself. The canalis vertebralis is formed by the several vertebral foramina among each other. The spinal cord, derived from the brain, runs through this channel and has in this way a bony protection. The spinal cord is surrounded by the pia mater, arachnoid mater, and duramater. The last one is the outermost and is responsible for keeping in the cerebral fluid. Between two vertebrae the spinal cord branched in a left and right spinal root which runs through the foramina intervertebrale (which are located at the heigt of the disci intervertebrales). This spinal cord continues until lumbar level L1. From then on, the top end of a nerve stays attached to the cord and its lower end exits the spinal column at its proper level. In this way, a bundle-like structure arises that extends from the end of the spinal cord further down while it gradually decline in number. This is the cauda equina which is enveloped by the dural sheath. Spinal stenosis is one of the most common causes of nontraumatic spinal cord injuries in people older than 50 years. Because of the aging of the population, incidence rates of acquired (or degenerative) spinal stenosis have been increasing. This kind of stenosis is due to the degenerative changes (ligamentum flavum, discus intervertebrales and facet joints) related to aging and occurs at the age of 50 and beyond. There are several types of spinal stenosis. Lumbar spinal stenosis and cervical spinal stenosis are the most common types and occur separately or combined. The thoracic spine is rarely involved. Epidemiological data suggests an incidence of 1 case per 100 000 for cervical spine stenosis and 5 cases per 100 000 for lumbar spine stenosis . The incidence of both types increases during the aging process . Spinal stenosis can be subdivided in a congenital, acquired or mixed form. Congenital spinal stenosis is present at birth and occurs mostly in the lumbar tract. It can be part of a skeletal syndrome such as Morquio syndrome, achondroplasia or Down syndrome, but it can also be idiopathic. The latter condition is characterized by shortness and thickness of the pedicles, shortness of the laminae or sagittal orientation of the facet joints. Shorter pedicles and laminae reduce the size of the foramen vertebrale and thus also a smaller spinal canal. The acquired spinal stenosis onsets at another point in life and occur more frequently both in the cervical and lumbar tract. Several possible causes are known: spondylosis (Cervical Spondylosis and Lumbar Spondylosis), disk bulging or disc herniation (this is not lasting, the herniated part of the disc dystrofies), ligamentous degeneration (hypertrophy/ossification of the ligamentum flavum), spondylolisthesis or a combination of these disorders . It may also be the result of systematic illneses, such as endocrinopathies (Cushing disease or acromegaly), calcium metabolism disorders (hyporarthyroidism and Paget disease), inflammatory diseases (rheumathoid arthritis and ankylosing spondylitis) and infectious diseases. A mixed form is a combination of congenital abnormalities with superimposed degenerative changes. This applies to patients who already have a narrow spinal canal and undergo degenerative changes  . Spinal stenosis can be congenital/primary or, as in most cases, developed/secondary and can have several possible causes. In most cases it concerns a chronic degeneration. Other causes can be rheumatoid arthritis , spine trauma, bone tumors or calcification of the ligamentum flavum. Spinal stenosis can occur at cervical, lumbar and less commonly at thoracic level. Lumbar spinal stenosis occurs more frequently, but is less dangerous than cervical spinal stenosis. The narrowing can be asymptomatic, but during the aging process most patients will notice radiating pain, weakness and/or numbness. These are secondary complaints caused by compression of the spinal nerves. Pain intensifies during neck flexion  Pain intensifies during prolonged standing, back extension and (downhill) walking. One single or combination of anatomic variation(s) can occur. In most cases stenosis occurs at the level of facet joints. At this level pathological changes in the disk and facets and hypertrophy of the ligamentum flavum cause the greatest amount of narrowing. At the level of the pedicles, stenosis is rather uncommon and indicates an underlying congenital of developmental stenosis of the bony canal. Central stenosis can be caused by degeneration of the vertebral disc. This can lead to narrowing of the spinal canal around the cauda equina . Symptoms usually involve buttocks and posterior thighs in a non-dermatomal distribution. Lateral recess stenosis can be related to the lateral recess. Symptoms are usually dermatomal because specific nerves are compressed. Patients may have more pain during rest and at night, but have more walking tolerance than patients with central stenosis. Foraminal stenosis is related to a narrowing of the spinal foramina . It can be the result of a reduced height of the intervertebral space. Foraminal stenosis is also related to age-related degenerative disease of the lumbar discs and/or lumbar facet joints. This increases bone deposition (i.e. osteophytes) due to abnormal redistribution of load bearing in the lumbar spine. Thickening of the joint capsule, osteoarthritis of the facet joints and cyst formation can also narrow the spinal canal or IV foramen. Lateral and Foraminal Stenosis can lead to compression of the nerve roots leaving the spinal canal. The L4-L5 segment is most frequently affected by LSS[a], followed by L3-L4[a], L5-S1 and L1-L2. Spinal stenosis can cause compression of the nerve roots of blood vessels, which can be related to the painful symptoms of spinal stenosis. During the differential diagnosis, red-flag symptoms must be assessed. If such symptoms are present, further diagnostic workup is immediately warranted. The differential diagnosis of spinal stenosis is broad and differentiation between several conditions may be complicated because of their frequent coexistence, certainly in the elderly. In these patients hip osteoarthritis and peripheral vascular disease are prevalent and could advance combined with spinal stenosis. Also a trochanteric bursitis is frequently observed in patients with symptomatic lumbar spinal stenosis. Lumbar spinal stenosis is related to neurogenic intermittent claudication. The symptoms of this diseaese (pain irradiation into the legs whilst walking and relief with standing) are similar to those of vascular claudication . If the sypmtoms are triggered by lumbar extension and downhill walking and relieved by lumbar flexion, the patient probably suffers from neurogenic claudication (whether or not originated by lumbar spinal stenosis). In case no changes occur during lumbar flexion or extension, the patient has more difficulty walking uphill and complains of cramping that begins distally and progresses proximally, the person probably suffers from vascular claudication. Also degenerative disc/facet joint pain, ankylosing spondylitis, spinal compression fracture, metastatic disease of the spine, vertebral osteomyelitis or discitis, primary spinal.intradural/intramedullary tumour, epidural abscess, diabetic neuropathy, peripheral neuropathy and radiculopathy due to a herniated disc are others disease that could be confused with spinal stenosis. Diagnosis is made by a doctor based on patient history and physical examination. In addition, medical imaging can be performed to confirm the diagnosis. X-rays are useful in searching for fractures due to trauma. It is also helpful in the evaluation of the alignment, loss of disc height and osteophyte formation. With oblique views a defect of the pars interarticaluris is detectable while instability is detectable with dynamic views. Instability is confirmed when the view shows a translation of more than 5 mm or a rotation of more than 10-15 degrees. Reversal of the normal trapezoidal disc geometry with widening posteriorly and a narrowing anteriorly can also indicate instability. The diagnosis of spinal stenosis can be made when bony narrowing, obliteration of epidural fat and deformities of the spine is detected on the X-ray. MRI (Magnetic Resonance Imaging) is used most frequently and gives the best results . MRI is very sensitive to degeneration and is used for the evaluation of lateral recess stenosis. Sagittal T2-images focus on the foramen vertebrale and are used to diagnose central stenosis. A lack of fat around the root indicates foraminal stenosis. Axial T1-images are used to search for extraforaminal stenosis by showing an obliteration of the normal interval of fat between the disc and the nerve root. MRI findings should always be matched to the symptoms and signs of patients with neurogenic claudication of radiculopathy. In many cases MRI replaces CT-scans. Degenerative changes of the spine are visible on MRI and increase with age. These degenerative changes appear in nearly 100% of people over the age of 60. 21% of people over the age of 60 are diagnosed with spinal stenosis. The sensitivity of MRI is 87-96% and its specificity is 68-75%. Preferably an MRI is taken with the patient in upright position. This enables the visualization of the patho-anatomical changes which occur during axial loading . A myelogram, which requires an injection of liquid dye into the spinal canal, is useful when followed by a CT-scan. The combination of both displays a good image of the center lateral canal and defines any extradural cause of compression. This diagnostic procedure is preferred in case of dynamic stenosis, when there are contraindications for MRI or in the absence of suitable findings on MRI. Direct measurements of the bony canal on CT-scans should be interpreted with caution, because they often give an inaccurate assessment of the degree of stenosis. Bone scan (shows where bone is breaking down or being formed). Lumbar spinal stenosis is related to neurogenic claudication, which is a leading cause of pain and disability. Therefore, specific questionnaires can be used for the assessment of a patient with lumbar spinal stenosis (LSS). The Swiss Spinal Stenosis Questionnaire also known as The Zurich Claudication Questionnaire (ZCQ) consists of three subscales that measure symptom intensity, satisfaction with treatment and physical function. The physical function scale is used primarily to evaluate walking capacity, which is reduced in patients with lumbar spinal stenosis. This questionnaire is a valid and reliable instrument for assessing patients with lumbar spinal stenosis. The Oswestry Disability Index for assessing self-reported levels of disability and The Maine-Seattle Back Questionnaire (a modification of the Roland-Morris Disability Questionnaire) are commonly used for patients with LSS. They are also valid and reliable instruments for that population..
Other frequently used questionnaires to determine the progression of symptoms, such as pain and other outcomes, such as level of satisfaction or disability are the Numeric Pain Rating Scale, the Patient Specific Functional Scale, the Oxford Spinal Stenosis Score and the Short Form 36 health survey (SF-36)..
Possible symptoms that occur during the examination are neurogenic claudication, which includes pain in the buttocks, thigh or leg during ambulation that improves during rest, or radicular leg symptoms with associated neurological deficits. These symptoms have to present themselves for at least 12 weeks . An older person with suspicion of spinal stenosis usually stoops forward while walking. Other possible symptoms should always be considered during the examination. Pedal pulses, pain on hip rotation and other tests should be performed depending on which symptoms occur and a full neurological examination should be done. 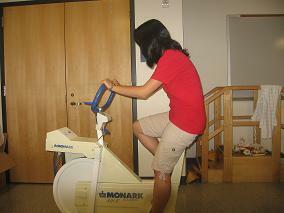 During this test the patient first pedals on a cycle ergometer in upright position with preservation of neutral lumbar lordosis. 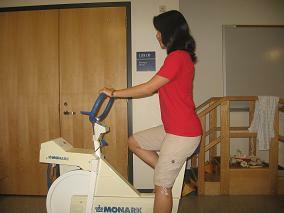 The distance the patient has pedaled in a certain amount of time is recorded. The patient has to pedal a second time in a slumped position with lumbar delordosing. The distance the patient has pedaled in the same time is recorded again. If the patient can pedal further in slumped position than in upright position, lumbar spinal stenosis is indicated. This test is evaluated on a treadmill. 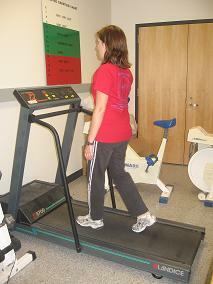 When the patient walks on the flat (0°) treadmill their back is in an extended position. The walking distance in a certain amount of time is recorded. 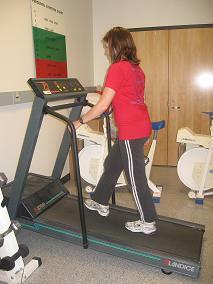 The patient walks on the treadmill a second time with an uphill slope, which means they walk in a flexed position. The walking distance in the same amount of time is recorded again. If the patient walks further on an uphill slope than on the flat treadmill, lumbar spinal stenosis is indicated. Exercise stress testing on a treadmillThe study of Deen et al  determined that this test procedure is a save and easy way to asses baseline functional status and surgical outcome in patients with neurogenic claudication due to lumbar spinal stenosis. By comparing pre- and postoperative results they concluded that this test procedure provides objective outcomes. Thus, this study claims that surgery is beneficial in most cases and is helpful in guiding subsequent management of patients with residual symptoms. The latter is interesting for the physical examination in patients with spinal stenosis. The test is performed on a treadmill at 0° ramp incline. There are two trials conducted for 15 minutes. The first time the patient should walk at a speed of 1,2 miles per hour and the second time the patient can walk at a pace of their own choosing. Between those two efforts there is a brief rest permitted to allow symptoms to return to baseline level. Many therapeutic modalities could be used in the management of spinal stenosis. Treatment plans must be individualized based on each specific patient's presentation. Spinal stenosis rarely leads to progressive neurological injury. Therefor non-operative modalities should be attempted first. These modalities are symptomatic, which means they help improve pain symptoms, but do not alter the underlying narrowing. Medication and epidural injections are non-operative treatment modalities for spinal stenosis. Medication includes anti-inflammatory medication, muscle relaxers, desensitizing medication and in some cases anti-depressant medication. To get the best pain relief and minimise side effects concurrent use of 2 or more pain medications are preferable than a single drug at high dose. Side effects that can occur because of medication are always a concern and allergies and use of other medication should be considered by the physician. Opiods and antidepressants are prone to increase the risk of falls and therefore in the senior age group this should be highlighted yo client and preventative falls training be sourced. Epidural steroid injection may relieve symptoms of spinal stenosis temporarily, but does not influence functional status or the need for surgery at 1 year  . There is still a lot of question about the long term effects and there are concerns about the risk for osteoporosis. Non-surgical therapy, including physical therapy, is usually successful. In those patient with persistent symptoms or progressive neurological deficits, surgical treatment should be considered. According to Skinner and McMahon a decompressive laminectomy is the procedure of choice for central and lateral stenosis, whereas a fusion is generally not indicated for spinal stenosis in the absence of instability. In case the patients suffers of symptomatic foraminal stenosis, a foraminotomy should additionally be performed. Decompression can be performed anywhere along the spine. Only laminaplasty is only performed in the cervical area. Usually a surgical incision is made in the back. However, cervical stenosis decompression can be performed through an anterior or posterior approach, depending on the location of the majority of the compression and the preference of the surgeon. A foraminotomy can be performed endoscopically, which results in a smaller less invasive incision. The surgery can be single-level or multi-level, depending on the extent of stenosis. Decompression surgery aims to reduce leg pain and improve neurological claudication and walking by creating more room for the nerves. Jones at al. studied the effect of decompressive laminectomy on leg and low back pain and concluded that not only leg pain is reduced, but there is also a positive effect on low back pain. The review of Ammendolia et al. also states that indirect compression seems to improve walking ability compared to non-operative treatment. The evidence of these findings is however of very low quality. Spinal fusion surgery inhibits a painful vertebral segment to move and aims to reduce pain generated from that joint. A bone graft is added to a segment of the spine and a biological response is set up to cause the bone graft to grow in between the two vertebrae so a bone fusion is created. This fusion results in one fixed bone segment replacing the mobile joint which prevents stenosis from recurring and decreases the pain caused by spinal instability at that site . In some cases, spinal decompression surgery may result in spinal instability. When this complication is expected, spinal fusion surgery can be done at the same time to stabilize the section of the spine on which the laminectomy of foraminectomy is performed. A spinal fusion surgery may be necessary in case of foraminal stenosis when a tilting of the segment in the coronal plane is present that further narrows the foramen. Foraminotomy and/or laminectomy can create instability in the process of decompressing the nerve roots. When this complication is expected, spinal fusion surgery can be done at the same time to stabilize the section of the spine on which the laminectomy of foraminectomy is performed. This occurs most frequently in the upper lumbar spine, where the pars tends to be narrower. Lee et al. found that patients with moderate pain undergoing a conservative treatment will have 50% pain relief in less than 3 months. In total 60–90% of all patients experience symptom relief after surgical or conservative treatment. Physical therapy is associated with reduced likelihood of patients receiving surgery within 1 year. Only symptomatic patients should be treated. There are no significant differences between conservative treatment and surgery for pain up to 2-year follow-up. From then on the results of the study favour surgery over physical therapy for pain and disability. Malmivaara et al favour surgery over physical therapy for all time points. Weinstein et al gave no differences between groups. The study of Atlas et al. concluded that at the end of the follow up period there is no difference in pain and overall satisfaction between patients who were treated with physical therapy or with surgery. Radicular symptoms did improve less after physical therapy. -Lumbar flexion exercises are done to reduce the lumbar lordosis. This is the most comfortable position for the patient because the symptoms reduce in combination with a decrease of the epidural pressure in the lumbar spinal canal. -Single and double leg knees to chest in supine position. This position should be held maintained for 30 seconds. In the single leg exercise the patient should alternate the legs. Double knee is a progressive exercise. -This exercise program should have a stepwise logistic regression during the first 6 weeks. -Treadmill walking is the final step in this program. In the over 70 age bracket a graded rehabilitation approach focusing on improving ambulation showed significant pain reduction. See the reference for comprehensive outline of rehabilitation exercises. An aquatic walking and jogging program has a beneficial effect on muscle function tests, the BERG balance scale and the fall efficacy scale. The ankle range of motion also increased. This program still has to be investigated. Corsets may help to maintain a posture of slight lumbar flexion to avoid atrophy of paraspinal muscles but it should be worn only for a limited number of hours per day. It also promotes back extension. A lumbar corset is significantly better than no corset for pain and walking capacities. The youtube below shows some good exercises to use in treating clients with LSS. Whitman et al. found that a program of spine manipulation, the pelvis and lower extremities, muscle strengthening exercises and body-weight supported treadmill walking had superior outcomes compared to a program that included lumbar flexion exercises, non-thermal ultrasound to the lumbar area, and a treadmill walking program in treating patients with spinal stenosis. The study also concludes that additional improvements in disability, satisfaction and treadmill walking tests can be realized by the inclusion of manual physical therapy interventions, exercise and a progressive body weight supported treadmill walking program. They also found that manual therapy in addition to flexion exercises and walking had similar effects to those of flexion exercises and walking alone. The study of Pua et al.showed that body-weight supported treatment was not significantly better than cycling for short term pain and disability. Koc et al.found that the addition of modalities (eg.ultrasound, TENS) to the conservative treatment are effective in reducing pain and improving function in patients with LSS. Goren et al. found that an exercise program plus modalities was significantly better than no exercise in short term for back pain, leg pain and disability. Fritz et al. says that if the recommended initial management strategies are not effective, aggressive conservative interventions should be pursued. This study also confirms that patients who take physical therapy treatment in the first six weeks are less likely to undergo surgery at one year follow up. They found higher levels of patient, who had physical therapy during 6 weeks, self-rated major improvements at 3 – 6 months and 1 year. They also had a greater reduction in leg pain after 1 year. Spinal stenosis can be described as narrowing of the passageways for nervous structures by degeneration or anomalies of adjacent structures. It most frequently appears in the cervical and lumbar region and more specifically near the spinal canal, the intervertebral foramen or around the facet joints. It can be congenital or acquired. The latter is strongly related to the ageing process. Symptoms don’t always manifest, but if they do, patients usually complain of pain and weakness in extremeties which intensifies during certain motions and postures. Spinal stenosis can easily be confused with other diseases that can cause spinal stenosis, because they induce similar symptoms. There are several ways to differentiate the possible causes of the occurring symptoms. After the anamnesis and physical examination medical imaging can be very helpful in the diagnosis. This includes X-rays, MRI-scans, CAT scans, myelograms and bone scans. There are also physical tests, the Bicylce stress test and Two-stage treadmill test, which can confirl suspicion of spinal stenosis. The degree of disability, symptoms and feelings related to spinal stenosis are measured by the Swiss Spinal Stenosis Questionnaire, the Oswestry Disability Index, the Maine-Seattle Back Questionnaire, the Numeric Pain Rating Scale, the Patient Specific Functional Scale, the Oxford Spinal Stenosis Score or the Short Form 36 health survey. The results of these assessments are considered in the decision of treating the patient surgically or conservatively. Surgical interventions that can be performed to decompress the nervous structures are laminectomy, laminotomy, foraminotomy and laminaplasty. The technique used depends on the location of the stenosis. Non-surgical treatment consists of analgesic medication and injections in addition to physical therapy. Physical therapy can reduce pain and disability and should be adapted to the individual characteristics of the patient. Considering multiple RCTs, it seems that manual manipulations and endurance and strength exercise training, both dynamically and isometrically, of the lumbar muscles are effective in the treatment of spinal stenosis. Home exercices, education and advice are important components of the physical therapy management. ↑ 1.0 1.1 Wise C., Spinal stenosis, American College of Rheumatology, 2013. ↑ 2.0 2.1 Ogiela D., Spinal stenosis, National Library of Medecin, 2012. ↑ 3.0 3.1 Cluett J., M.D, Spinal stenosis, Orthopedics, 2010. ↑ Netter FH. Atlas of Human Anatomy. 4th Edition. Philadelphia: Elsevier; 2006. ↑ 7.0 7.1 7.2 7.3 7.4 7.5 7.6 7.7 7.8 7.9 Skinner HB, McMahon PJ. Current Diagnosis& Treatment in Orthopedics. 5th Edition. U.S.A.: Mc Graw Hill Education; 2014. ↑ 28.0 28.1 28.2 28.3 1. Goldman L, et al. Questions and answers about spinal stenosis. National Institute of Arthritis and Musculoskeletal and Skin Diseases. Cecil Medicine. 24th ed. Philadelphia, Pa.: Saunders Elsevier; 2012. ↑ Pratt RK, Fairbank JC, Virr A. The Reliability of the Shuttle Walking Test, the Swiss Spinal Stenosis Questionnaire, the Oxford Spinal Stenosis Score, and the Oswestry Disability Index in the Assessment of Patients With Lumbar Spinal Stenosis. Spine. 2002 Jan 1;27(1):84–91.